This beautiful, almost semi-circular, cove eight miles east of Weymouth makes up part of the stunning Dorset coast. Lulworth Cove was thought to have formed approx. ten thousand years ago. 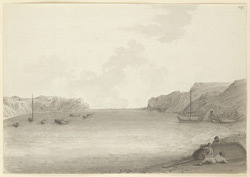 It was a popular spot for smugglers during the 18th and 19th centuries.